Side salads can often be forgotten about with the hustle and bustle of preparing main dishes or gathering the perfect ingredients for that planned pud. This Butternut squash platter not only adds colour to your table and lots of flavour, it is also is far too easy to not share. It's perfect for those cooler spring lunches, it can be served warm but still gives you that bubble of excitement that summer is round the corner, as you can now weigh into at least the dreamy idea of alfresco dining we all love when those long summer evenings start and days seem endless. Start by roasting up your butternut squash with oil, chilli and a good shake of salt and pepper. Roast in the oven for around 30-40 mins until IT'S squash is soft but still holds it shape and not mushy. 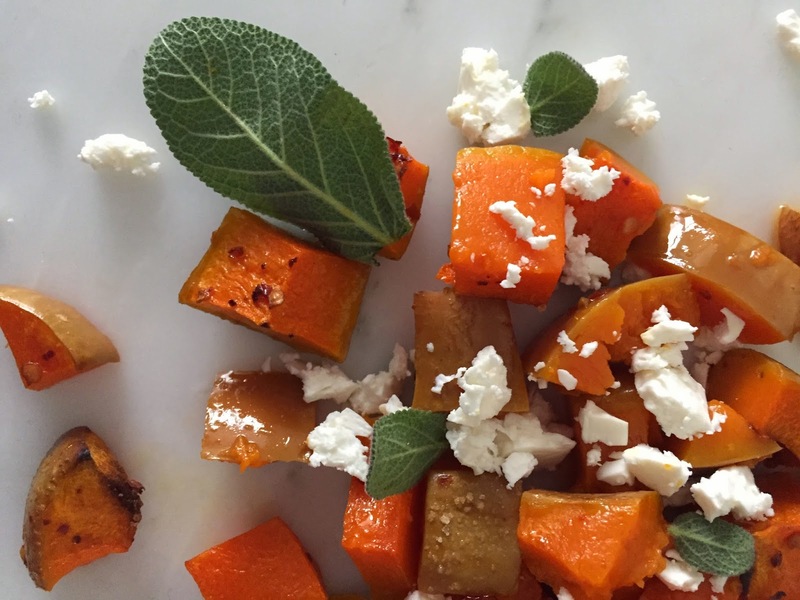 Carefully spoon out your deliciously roasted squash and scatter on a plate or dish. Next sprinkle over your crumbled feta and dress with fresh sage for colour and added flavour. If you like it hot you can always dust over a few extra chilli flakes or slice up a fresh one if you like it really hot! Enjoy with friends this weekend alongside a traditional roast or just on its own!